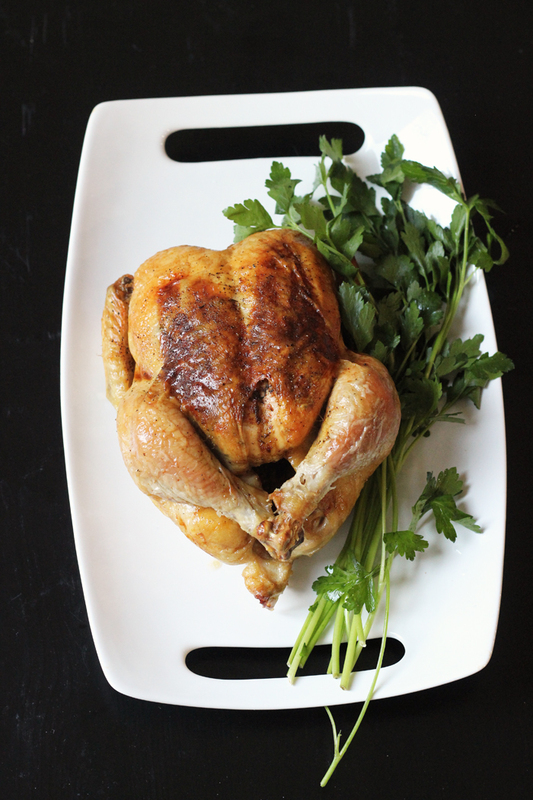 Preparing a Roast Chicken at home doesn’t have to complicated or require fancy tools. Enjoy this traditional comfort food every week with this simple method. 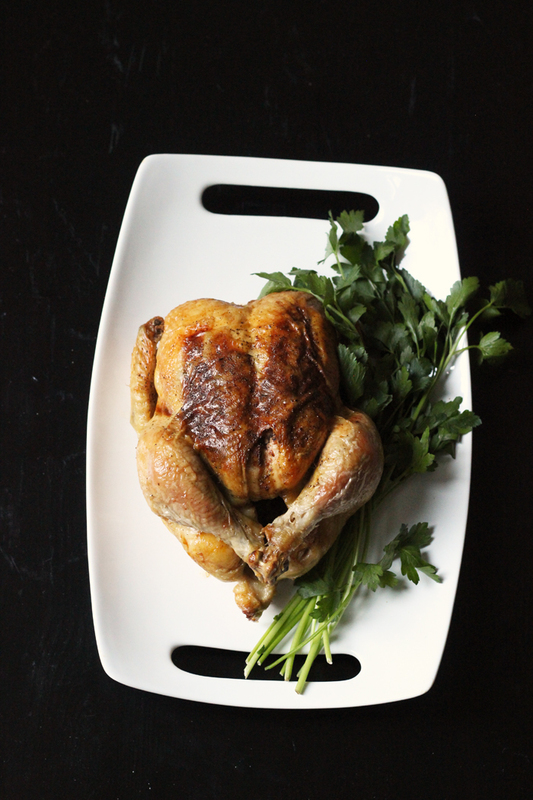 Whole Roast Chicken can be one of the most economical — and delicious — ways to serve chicken. Here in Southern California, I regularly find whole chickens on sale for as low as $0.88/pound. For a large, five-pound chicken, this works out to be about $3. Add some spices and butter, maybe a few vegetables, and you’ve got a great tasting main dish. 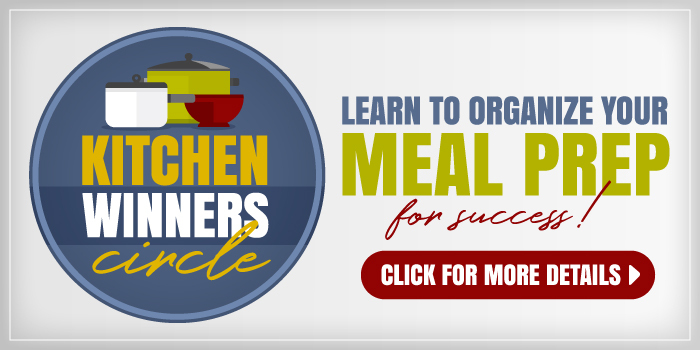 Even if you don’t find an incredible sale, preparing a roast chicken can still be economical, especially when you consider how many meals you can make from one initial recipe. Serve roast chicken and gravy as the main dish one night, use leftover chicken in a homemade Chicken Pot Pie the next night, make homemade stock with the carcass, and make Thursday Night Soup the final night. You can easily get three meals from one Roast Chicken! Cooking a whole bird can be a little intimidating. It’s my hope to break down these steps so that you won’t feel overwhelmed by it. This is easy, really. 1. Remove the chicken from its packaging. It needs to be completely thawed or close to, so if you’ve frozen it, you’re going to need to allow adequate time for defrosting. Reach inside both ends of the chicken and remove the giblets and neck. If you’re brave, you can cook with these; they make great gravy. But for now, let’s keep it simple. Discard. There is debate on whether or not you should rinse your uncooked poultry. While it was how I was taught to prepare poultry in the last century, recent research has shown that the risk of cross-contamination is bigger than any benefit derived from rinsing. In fact, the USDA strongly advises against rinsing your chicken. 2. Place the chicken in a roasting pan. 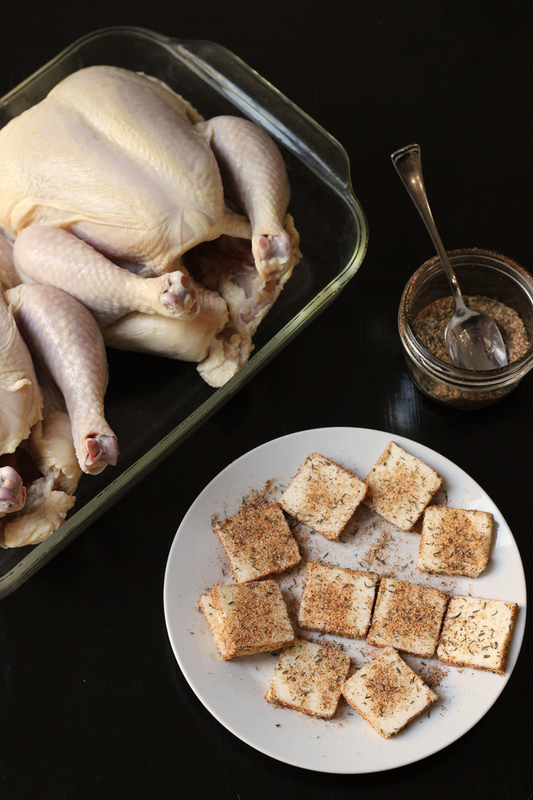 A simple 9×13 glass dish will work for most standard-sized chickens. You will need a larger roasting pan for a whole turkey. Pat dry with paper towels and discard those. Remember raw chicken can harbor unsafe bacteria, so avoid cross-contamination. Assemble other ingredients, such as butter, oil, or ghee; salt and pepper or a favorite seasoning mix; and some aromatics, such as a peeled and chunked onion, a peeled and chopped carrot, fresh herbs. 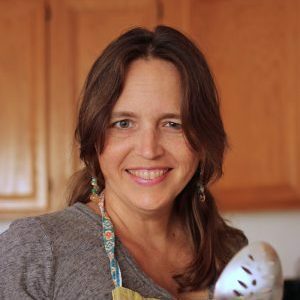 You can make a special herbed butter to slip under the skin to add flavor and moisture, or you can try my lazy cook shortcut: slice a stick of butter into pats, season generously with your favorite seasonings and use those pats to slide under the skin. Looks weird, tastes great! 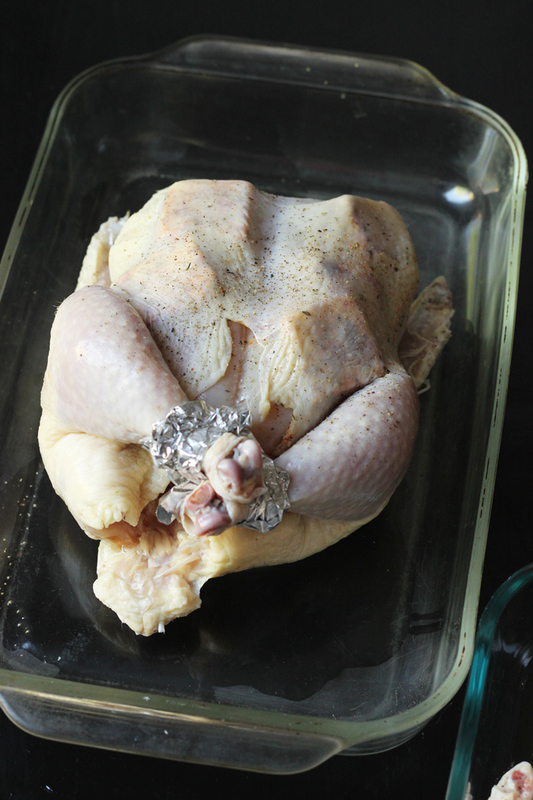 Loosen the skin from the chicken meat by sticking your hand in between the two layers. No, it’s not for the squeamish, but you’ll be okay. Slide the butter between the skin and chicken meat. You can also oil or butter the outside of the chicken to help crisp the skin and season it generously with salt and pepper or a favorite seasoning blend. I love this Cajun Spice Mix. Place your aromatics, such as onions, carrots, and herbs inside the cavity of the bird and truss the legs with kitchen twine, or if you’re out, aluminum foil. Ahem. Roast the bird in a 375° oven for 1 1/2 to 2 hours for a 3 to 4 pound chicken, 2 to 2 1/4 hours if chicken is a 5 to 7 pound roaster. Test with an instant read meat thermometer. It should read 180° to 185° F. Remove the chicken from the oven and allow to rest 5 to 10 minutes on a platter or cutting board before carving. 5. Serve or use in recipes. Enjoy your roast chicken with mashed potatoes and gravy! And don’t forget that you can make a couple more meals with ALL the leftovers, bones and all. Preheat the oven to 375°. Place the chicken in a roasting pan. Slice the stick of butter into pats. Season the pats generously with salt and pepper or your favorite seasoning mix. Slide these pats under the skin of the chicken. Stuff the cavity of the chicken with the onion, carrots, and herbs. Truss the legs. Spread the outside of the chicken with enough olive oil to coat, about 2 to 3 tablespoons. Season to taste with salt and pepper. Roast the chicken for 1 1/2 to 2 1/2 hours or until the meat reaches an internal temperature of 165°. 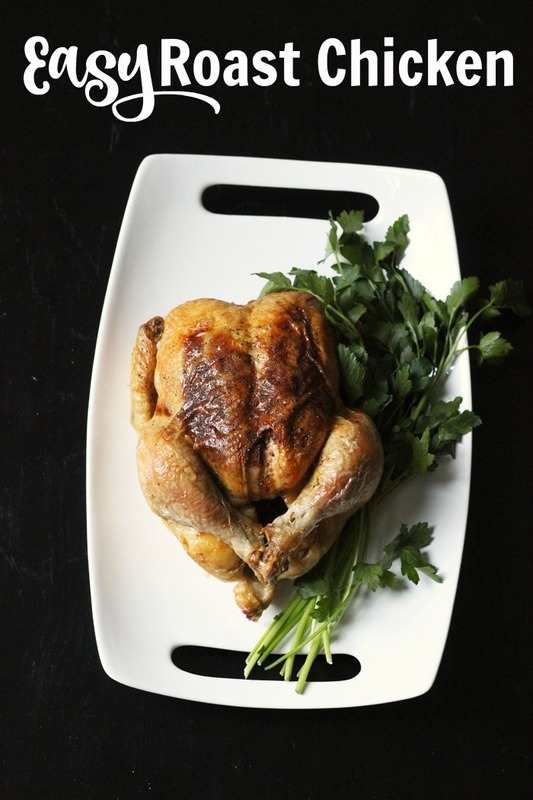 Remove the chicken to a cutting board for carving. Note: for whole 30, you can use seasoned ghee instead of butter or simply skip the butter under the skin steps. Originally published October 19, 2009. Updated August 26, 2017. 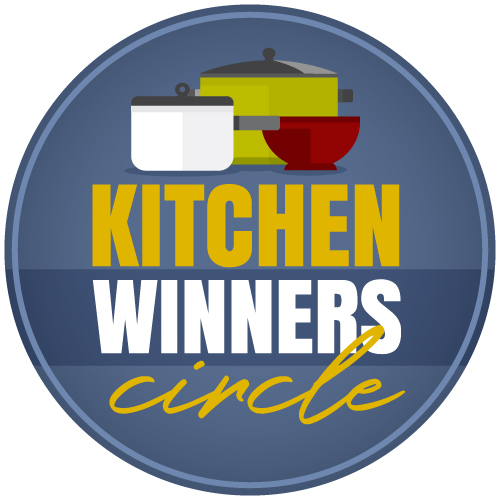 To make a crockpot chicken, how long do you cook it for…high or low, any broth, etc. Never done a chicken in the crockpot before…help! I never add broth. Just season and place in crockpot for 6-8 hours on low or about 4 on high. Yeah! Thanks for saying so! I live in coastal Alabama and whole chickens cost about $8-9 each. It is cheaper to by one already cooked. The deli sells it between $5-6. I rarely see it on sale….wonder why? That is odd. They just went on sale again here for $0.89/pound. I can usually get a chicken for under $4, even now, 4 years after writing this post.